This article discusses the importance of the moral formation of students who are in training for the Christian ministry. Moral formation is defined and its importance is discussed with reference to the scholarly debate, both in South Africa and elsewhere. The complex nature of moral formation, the individuality of students and the multiplicity of contexts in which formation takes place are noted. A model that has God's grace and human volition at its core and discusses the goals, obstacles and means of moral formation, is presented. It extends beyond a 'head, hearts and hands' approach and discusses the crucial areas of thinking, being, relating and doing. It seeks to avoid the extremes of both indoctrination and laissez-faire non-involvement with ministerial students. Hierdie artikel bespreek die belangrikheid van morele vorming van studente in Christelike bedieningsopleiding. Morele vorming word gedefinieer en die belangrikheid daarvan word bespreek met verwysing na die wetenskaplike debat in Suid-Afrika en elders. Die komplekse aard van morele vorming, die individualiteit van studente en die veelheid van kontekste waarin vorming plaasvind, word genoteer. 'n Model wat God se genade en menslike wilsinspanning as kern het en wat die doelwitte, struikelblokke en middele tot morele vorming beskryf, word voorgelê. Dit strek veel verder as 'n 'kop-, hart- en hande'-benadering en bespreek die kritieke areas van denke, wese, verhoudings en handel. Dit streef daarna om die uiterstes van indoktrinasie sowel as laissez-faire onbetrokkenheid teenoor teologiese studente te vermy. All that is relevant to moral formation in ministerial education cannot be covered in a short article. Hence, I do not discuss the wider context of ministerial education (Van der Water 2005; Amanze 2009; Mugambi & Nasimiyu-Wasike 1999) nor enter into a detailed analysis of approaches to and models of ministerial training in South Africa (Conradie 1997; Kumalo & Richardson 2010; Kretzschmar 2011; Naidoo 2012a; Naidoo 2013). The process and criteria that different church traditions or denominations use to accept candidates for ministerial formation, and later for ordination, are not discussed here. Nor are the programmes of ministerial training used at specific universities or colleges discussed in this short article. The aim of this discussion is to define moral formation, explain why it is a contested issue, defend its importance and outline a model for it. This model is multi-faceted yet practical, and encourages further debate, adaptation, application and revision by staff and students at universities, theological colleges and Bible schools. Some institutions do offer Christian or theological ethics as a subject, but teach ethical theory and issues to the exclusion of moral formation. Other institutions place so great an emphasis on subjects like biblical studies and systematic theology that ethics hardly features, despite the preponderance of ethical problems in our society. Another tendency is that the ethical issues that arise within other theological disciplines are not emphasised sufficiently or linked to current social affairs. Finally, some institutions may fail to integrate ethical thinking with spiritual and moral formation in the formal classes, college activities and the lives of the staff and students. What of the methodological approach adopted? Firstly, an integrated approach to moral formation is proposed. Both ethical theory and moral formation are incorporated in the proposed model as cognitive, and other forms of conversion (such as relational) ought not to be separated. In ministerial education, academic discourse ought to be integrated with practical moral formation. Secondly, rather than simply repeating earlier academic discussions of the need for moral formation,2 ways of addressing them are suggested. Marshall (2009:63, 65) notes the role of context, supports an integrated approach and states that formative practices must include multiple paths and diverse ways of imagining how to support and nurture the qualities and characteristics important in religious leadership'. For example, the Bossey Institute situated near Geneva uses Bible study, worship, common meals, required periods of residence, abundant opportunities for causal interaction ... formal instruction, ... [and] the informal exchange with peers' (Gilligan 1997:39-40). Thirdly, in line with Lamoureux's statement (1999:143) that 'through the study of sacred texts, we maintain contact with the spiritual tradition, with sources of wisdom and insight that culture may obscure', several references to biblical passages that deal with moral example, teaching and failure are included, although space does not allow any detailed exegesis. Biblical narrative, poetry, psalms and teaching on moral matters are accessible to all and they highlight God's interaction with human beings in a variety of socio-cultural and historical contexts. Fourthly, the discussion draws on several local and international theological sources on ethics and moral formation. Empirical studies on theological colleges and education, particularly within an African context (e.g. Naidoo 2005; 2008; 2011; Oliver 2013) have also been used. Reference is further made to studies that combine theological and psychological insights (Mcintosh & Rima 1997; Hall 1997; Van der Ven 1998; Van Niekerk 2009). Finally, I draw on my experience of many years of personal contact with students and staff at universities and theological colleges. What is moral formation and why is it necessary? There are several contestations around the subject of this article. One relates to the nature and goals of theological education and ministerial training as noted above. Yet, an extensive volume on theological education in Africa (Phiri & Werner 2013) did not include a chapter on moral formation. A second contestation is the contemporary questioning of all authority figures, exacerbated by accounts of heinous crimes against children and women perpetrated by some priests and pastors, or other examples of dire moral failure. The credibility of the Christian ministry itself is being questioned. Hence, the need for a focus on moral formation to prepare students for the complex, infinitely rewarding and demanding calling of Christian ministry. Because the life and work of the minister affects the congregation and is constantly in the public eye, moral credibility is crucial. Thirdly, in a 21st century context of pluralism, secularisation and moral relativity, the nature of morality and Christian moral norms are questioned. Christians need to critique the roots and effects of this moral uncertainty as the absence of moral obligation and vision leaves humanity without moral purpose and motivation. Fourthly, the question is: Ought any type of formation to be attempted? Some theological teachers are resistant to the very idea of a model seeing it as too restrictive, directive, authoritarian and dismissive of the personhood of the student. Overend (2007:137), however, suggests that a shared moral tradition avoids both the extremes of indoctrination ('the submission of the self to a dead authoritarianism') and complete autonomy ('the emergence of an infinite number of personal theologies'). Whilst distortions must be avoided, the task of formation cannot be abandoned. This article seeks to occupy the space between indoctrination and laissez-faire non-involvement. Fifthly, the current state of the world, our country and the church reveals the urgent need for moral formation. In contexts where lack of moral understanding, malice, dysfunctional relationships, unfair treatment and brutal behaviour abound, can theological educators and church leaders simply wring their hands? No, they have a moral responsibility to do all they can to facilitate the moral formation of the ministerial students they send into the church and society. Finally, what about the professionalism of priests or pastors? It is necessary to construct an ethical framework to guide reflection on the moral demands of professional ministry, especially on sensitive areas like counselling, infidelity, child abuse, social conflict and church-state relations. Authors such as Trull and Carter (2004:185-214) and Marshall (2009:62, 68-69), discuss pastoral ministry and professionalism. Arguably, priestly ministry has been a profession for many centuries. Like other professions, it requires trustworthiness, integrity, confidentiality, sound knowledge, exemplary practice, self-regulation, community leadership, the proper use of power and the avoidance of financial, sexual and other misconduct. Christian ministers further need to use their spiritual authority to advance the interests of the gospel and their parishioners. This article makes it clear that if moral formation is pursued, not only will Christian ministers meet, but also exceed the moral expectations of other professionals. This is because the minister's vocation is derived first, not from society, but from God. The service a minister performs is not only a social service, but also a priestly and prophetic ministry. Thus, ministers are expected to 'internalise' and live out the Christian tradition, not simply proclaim it in words. In the training of ministers (and in their ongoing growth once they are in ministry) it is essential to distinguish between genuine and distorted forms of morality. Such distortions include hypocrisy, legalism and self-righteous moralism (Kretzschmar 2004:87-89). Hypocrisy involves lying to oneself (Trull & Carter 2004:63); behind the show there is a lack of personal truthfulness. Closely linked to hypocrisy is a self-righteous moralism (Lk 18:9-14).3 Moralism is rooted in self-effort and has only the appearance of morality. Moralists criticise the lack of personal and/or social ethics in others, but remain blind to their own lack of moral character (Mt 7:1-5). Finally, whilst rules and laws are important in the ordering of society, morality cannot be reduced to them. Being moral demands more than avoiding the breaking of the law; it is a deep adherence to doing what is right in obedience to God and in service of others. Trull and Carter (2004:57) state '... the greatest weakness of legalism is that it almost always hinders moral maturity and stimulates egotistical pride'. Because the formation of moral character is often linked to sacrifice and hardship, people shy away from the cost of the moral journey, realising both instinctively and rationally that it is a difficult and dangerous road to take. In addition, ministerial students have different family and social backgrounds, personalities, abilities, spiritual gifts and ministries. However, moral formation is not an optional extra; prospective ministers need to take personal responsibility for their own formation under the guidance of the Holy Spirit within the Christian community. In this discussion, moral formation is understood to be the process of becoming a person of moral character who can think through moral issues, make moral decisions and act rightly. Also, such a person must grow in righteousness or integrity, develop moral credibility, build sound relationships and be able to inspire moral formation and conduct in those who love God. Such ministers will be able to facilitate the growth of moral formation in others so that the church becomes a moral community that can do what is good and act against evil. Because of the individuality of students and the contexts from which they come, a multiplicity of methods needs to be built into any approach to moral formation.4 Nevertheless, moral formation cannot be achieved without purpose or intention. The strategic intentions of the theological institution as a whole and the efforts of the staff members and students need to be aligned if such formation is to be achieved (Naidoo 2005; 2011:135).5 Further, the matter of moral formation needs to be fully understood and debated if one wishes to evoke the active participation of students. Otherwise they may only reluctantly or superficially - acquiescence to what is expected. There are many models of Christian spirituality or moral formation that one can draw upon. For example, Catholic formation stresses the human, spiritual, intellectual and pastoral elements of moral formation (Pastores Dabo Vobis 1992).6 Another writer, Lamoureux (1999:142), speaks of the importance of the 'conversion of mind and heart, fostering integrative thinking, character formation, promoting authentic discipleship, personal appropriation of faith and knowledge, and cultivating a spirituality of the intellectual life'. In addition, she (Lamoureux 1999:151) speaks of the need for four conversions: the religious ('a personal appropriation of faith'); moral (internalising 'the norms and values of the Christian faith); cognitive ('appropriating knowledge previously learned but not made one's own'); and affective ('the transformation of the deepest life of feeling'). Richardson (2007:147) speaks of a focus on the head (knowledge and understanding), heart (values and commitment), hands (practical operational skills) and feet (action and a way of life). Overend (2007:145) argues for the use of a habitus model that facilitates the 'development of the whole person within a community of faith', avoids dogmatic application, competitive individualism and narrow rationalism, embraces critical theological methods and encourages community life. The models discussed above are drawn on in the development of the new model provided in Figure 1, but I place more emphasis on relationships and actions. This is in line with the five conversions required for the development of moral leaders, namely the intellect, emotions, volition or will, relationships and action (Kretzschmar 2007:27-36). In the model used, the vital internal formative factor of volition is placed at the core of the model along with the spirit-forming work of God within human beings. 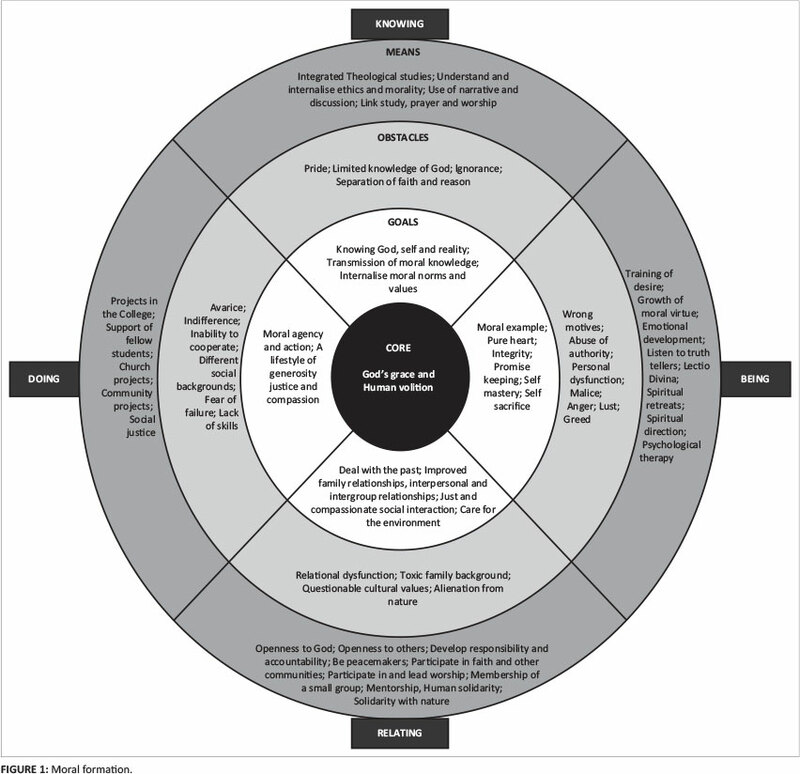 The model is divided into four quadrants, representing the various areas that require integrated attention in moral formation, namely knowing, being, relating and doing (Kretzschmar 2012:146-167). Radiating from the core circle each quadrant includes a discussion on the relevant goals of, obstacles to and possible means of moral formation. This model is relevant to different modes of education, including residential, distance7 and the use of a 'block' system (White 2006; Naidoo 2012b; Olivier 2013), however more self-direction will be expected of students not in residential training. In Christian experience moral and spiritual formation cannot be neatly separated. Naidoo (2013:8) argues that, 'Moral formation is an aspect of spiritual formation; spiritual maturity results in moral formation and committed discipleship.' To be spiritually formed is to be formed in the image of Christ and this process results in the moral formation of individuals and groups. Thus, a believer's deepening relationship to God (grace) is the foundation and motivation for their moral formation. This, together with the willing obedience and cooperation of human beings (volition) form the core of the model. Moral formation as understood in this article, includes intellectual development (knowing), character development (being), relational development (relating) and the growing ability to do what is right in all spheres of life (acting). In the New Testament, we see how Peter was shocked to the core of his being by his denial of Christ and how his subsequent actions were influenced by this kairos moment and Christ's injunction (Mt 26:69-75; Jn 21:15-19). Mary Magdalene's life changed radically as a result of her encounter with Christ (Lk 8:1-3l) and she was one of the first to grasp and proclaim that Jesus had risen from the dead (Jn 20:1-18). Paul's dramatic 'Damascus road' experience (Ac 9:1-30; 22:6-21) marked the beginning of his joyful and arduous ministry to the Gentiles. In Christian theology, human beings are regarded as God-created beings. Human beings are further called to be redeemed and to become co-workers in God's Kingdom. This is also an invitation to which each human being must respond. Without a human response to the grace and forgiveness of God made possible by the life, death and resurrection of Jesus Christ, no formation can take place. Thus, Paul argues that whereas grace cannot be earned by human effort or 'works', Christian living does need to result in 'good works' (Rm 5:1-5; 6:12-14; 12:9-21; Eph 2:1-9; 4:17-32). For Peter, Mary Magdalene and Paul, the call of God had to be followed up by God-inspired and motivated, yet still free, human action. This is the reason why human volition, the effort of the will, is so vital. If getting out of bed on a cold winter's morning requires an act of the will, how much more important is the role of the human will in moral formation? Callahan (1991:37-61) has investigated human conscience and free will, showing their importance in personal formation and moral agency. But sin has distorted every part of human nature, including the will. If the will is to be turned away from performing acts of evil to doing what is right, it must be redeemed and a God-directed conscience formed. Only then can human beings develop ears that hear, receive the word of God and act on the basis of moral wisdom (Jr 6:10; Mt 13:15-17; Lk 6:46-49). In 1 Corinthians 9:24-27, Paul states that Christians need to be trained like athletes to live the Christian life. The human will needs to be surrendered to God's purposes for it to be developed and properly employed by staff and students alike. Ministers, who are passive when moral action is required, are as little use in the ministry as those who have no self-control and direct their will to wrong ends, such as giving way to violent anger that increases rather than defuses conflict. As noted above, knowing God and being known by God is fundamental to right knowing. This enables a change in consciousness; a turning towards God in all of life. Openness to the Holy Spirit, a willingness to admit errors or ignorance and to grow in understanding are vital goals that need to be embraced. In the book of 2 Peter, for example, the word knowledge is used several times (2 Pt 1:2, 3, 5, 6; 2:20; 3:18); knowledge of God is central and knowledge is linked to goodness, self-control and the ongoing experience of God's grace. Knowing can also be understood as the ability to acquire and process information, gain knowledge of a field of study or an aspect of life, and develop an artistic, technical or ministerial skill. One can also speak of a relational knowing, in which one learns to understand people, has sound relationships with others or has an intimate, sexual knowledge of another person. (Self-knowledge is discussed under 'being' below). In the teaching of ethics or moral theology, the moral norms (such as loving God and one's neighbour) and values (like justice, fairness and compassion) of the church are transmitted or passed on (Van der Ven 1998:125-179; Van Niekerk 2009:111-113). Thereby, students are introduced to what is right and good, and how to live rightly. However, these values and their implications need to be fully discussed and internalised, or made their own, by students. Also important are the prudence, correct judgement and wisdom that are required to make correct moral judgements in daily life. In addition, a well-formed conscience, and the inner knowledge of moral truth, will enable a student minister to discern right motives and behaviour, be self-directed, be committed to what is good and be able to use knowledge, intuition and emotional wisdom to effect morally beneficial outcomes (Callahan 1991:171-198; Spohn 2004:131-133). Moral knowledge is not only important for the growth of the individual, but also to provide information and direction for right living in society. In the formal teaching of ethics, moral theory, ethical issues,8 decision making and moral formation all ought to be covered. Overall, the task is to determine what a truly good life is and how people and communities can live rightly - an analysis that is sorely needed in South Africa and elsewhere. Pride, understood as human arrogance and self-sufficiency, is an obstacle to right knowing, because it ignores human dependency on God, others and creation. Whilst self-respect, esteem and fair self assessment are required in the formation of personal identity (Ogletree 2005:40-41), pride overestimates human moral capacity and impacts negatively on relationships. Another obstacle is ignorance of self, the scriptures, others and life in general. A pastor, who lacks understanding of the struggles and realities of life in 'the world', preaches nonsense or lacks discernment, cannot expect to be respected by the congregation. Further, a too narrow understanding of the gospel that reduces its content and implications, for example to either economic liberation or private prayer only, will not enable the growth of a full understanding of the link between faith and life. Another important obstacle is a distorted or limited image of God. If God is understood by a student minister as, for instance, a brutal judge, an unfair and punishing fault-finder, a foolish but very generous 'Father Christmas', or a distant and disinterested Being, he or she will not seek a deeper relationship with such a God, nor encourage others to do so. It is important to challenge, head-on, the assumptions of Enlightenment thinkers such as the philosopher Immanuel Kant who taught that reason ought to be separated from faith (Billy & Orsuto 1996:23; O'Keefe 1995:13). True faith cannot be separated from the intellect, since the latter is an essential part of the redemption needed by human beings. Hence, the emphasis in the Bible on thinking, reflecting, meditating, learning and understanding God, ourselves and our world (e.g. 1 Ki 3:7-15; Ps 119; Pr 2:1-15; Rm 12:1-2; Col 1:9-14; 2:1-5). Theological educators also need to challenge the view of many post-modern thinkers that truth is unattainable and that spirituality must be separated from religion. Certainly, the pursuit of truth is difficult, but if Christ is the Truth, as the gospel of John asserts (Jn 1:14-18; 8:31-38; 14:6; 16:12-15), the truth about life, one's character and relationships is attainable in direct proportion to one's growth into the image of Christ (spiritual formation) and the increased wisdom that results from an intentional living of the Christian life. Finally, there may be '... a struggle between guarding the free inquiry and scientific objectivity revered by scholars, and protecting the beliefs and religious traditions valued by local churches' (Naidoo 2011:139). Thus, a way needs to be found to help students to remain true to their faith in God, but to deepen their understanding of it. Students come to their theological studies, especially if they are older, with a set of views on morality and faith. These need to be evaluated in light of the courses and study material offered. Furthermore, discussion of ethical theory, issues and decision-making need to be integrated with the study of moral formation and the personal views and experiences of students. Otherwise there will be no 'active' learning or the integration of moral theology with day-to-day living. Acquiring knowledge of what is right by studying ethical theory must be supplemented by the use of narrative or story. The lives of those we encounter in the Bible, Church history and contemporary experience provide a source of moral wisdom and teaching (Ellsberg 1997). They reveal the complexities of moral action and can encourage ministerial students to envision ways of acting morally in the world. Students also need to be helped by their teachers to integrate what they learn in the ethics class with the content of their other classes. For example, studies of the Old Testament prophets can teach students a great deal about the moral failure of individuals and nations and how human beings and societies need to align their motives and actions with those of their Creator. Similarly, studies in systematic theology and practical theology on human nature, sin and the church can be linked to studies in ethics. Such studies can also be linked to the students' personal devotions, daily experience and the church or college chapel services they attend. Study is an important spiritual discipline (Foster 1978:54-66), but it needs to be combined with private prayer and public worship. Ministers are formed in many ways, but formal education, a deep study of the Bible and attention to the insights of those who lead worship are important means of achieving the moral formation of the mind. Congregations (and theological teachers) have many expectations of ministers. These include good preaching, effective administration, managing the finances of the church, pastoral counselling, mentoring others, being spiritually mature and facilitating social ministry beyond the walls of the church. It is a mistake to expect any one minister to be able to fulfil all these tasks in an exemplary manner. Hence, to avoid burnout, priests and pastors need to learn to work to their strengths, reduce their weaknesses, delegate responsibilities and facilitate the discipleship and ministries of others. However, it is legitimate to expect a minister to become a moral example that others can follow. The hard question students (and theological teachers) need to ask is whether they can say with Paul, 'Be imitators of me, as I am of Christ' (1 Cor 4:16; 11:1). What moral expectations or goals are outlined in the New Testament? Zuck (1998:114-123) identifies the many qualities that ought to be present in the life of a disciple. These include having a pure heart, a good conscience and a sincere faith. Disciples ought to be obedient to God, temperate and able to manage their households and the church well (1 Tm 1:5, 19; 3:9). In Colossians 3:12-17, Paul speaks of compassion, kindness, humility, meekness, patience, bearing with one another and forgiving one another. Galatians 5:16-26 contrasts immoral and moral behaviour. Other examples of moral virtues include being honest, trustworthy and transparent; being capable of having appropriate and caring relationships with others; being dedicated and spiritually mature and exercising power in an appropriate manner. Ministers are expected to have integrity and to be prudent, that is, able to exercise discernment or sound judgement. Carter and Trull (2004:55) state that ministers ought to practice 'promise keeping' and 'truth telling', not harming other people, but rather doing what is good for them and being just in their actions. Ministers are further expected to practise self-sacrifice, that is, a life lived in loving and wise service of God and others. None of this can be achieved without discipline and self-mastery, hence some scholars (Van der Ven 1998:43-79; Van Niekerk 2009:104-108) argue that a person who does not have self-control cannot lead or advise others. One obstacle to personal moral formation is that of wrong motives. When a young man from Latin America, Helder Camara, told his father he wanted to become a priest, he was told that a priest belongs not to himself, but to God and to others (Ellsberg 1997:65-67). Those who enter the ministry because they do not know what else to do, see it an opportunity to have a comfortable existence, or who wish to exercise power over others, ought not to be ordained. The church can ill afford ministers who abuse their spiritual authority, are weak, incompetent, engage in immoral relationships, are drunk, misuse church money, fail to teach and disciple their congregations, are uncaring and bring the church into disrepute. Hall (1997:241-250) discusses personal dysfunctions, such as lack of emotional well-being, relationship problems, burnout and personality deficits. Jesus highlighted the sins that come from the heart or inner being of a person as '... evil intentions, murder, adultery, fornication, theft, false witness, slander' (Mt 15:19). In Colossians 3:5-8, Paul says: 'Put to death ... fornication, impurity, passion, evil desire, and greed (which is idolatry) ... But now you must get rid of all such things - anger, wrath, malice, slander, and abusive language from your mouth.' However, to get rid of such attitudes and actions is not easy, given the capacity of the human heart for self-deception. Catholics speak of the seven 'deadly' or capital sins, that is, sins that are the source of evil actions (Childress & Macquarrie 1986:577).9 Willard (1988:164) describes these sins as legitimate desires gone wrong. Vest (2000:70) re-categorises these sins into eight 'disruptive thoughts or excessive feelings': gluttony, lust, avarice (greed), anger, sadness (depression or dejection), despair (acedia, sometimes called sloth, but better translated as restless despairing), vainglory and pride. People are motivated by what they desire and therefore desire itself needs to be trained; turned away from what is damaging and sinful towards that which is spiritually healthy and emotionally healing (Vest 2000:59). Moral virtues and character develop within relationships and actions, for example, the characters and motives of Moses and Paul changed radically as a result of their relationship with God and what they were required to do. One can only speak of moral character when moral virtues (such as honesty and courage) have become active inclinations or dispositions (Ogletree 2005:37-39) expressed in moral actions. In the next two sections the emphasis is on relationships and actions -the key means of character formation. The use of moral vision and imagination as awakened by narrative, using biblical stories, stories of other pioneers and prophets - and our own stories - are other means of achieving moral formation. Hauerwas (1981:9-12, 36-52) argues that Christians need to be 'shaped' by the Christian story and learn to 'live' this story in their own contexts. Though at times difficult and unpleasant, listening to one's critics and to those who are 'truth-tellers' is important. If what they say is true, their insights will reveal those hidden parts that require attention. Other means of overcoming obstacles to moral formation include using the lectio divina [divine reading]10 method of reading the Bible, attending spiritual retreats and obtaining guidance from a spiritual director. Lamoureux (1999:144) points out that 'a central purpose of prayer and contemplation in the spiritual life is to see through and beyond the appearance of things, to penetrate the surface and to touch that which lies beneath'. By practising spiritual disciplines, such as meditation, prayer and fasting (Foster 1978:13-53), students open themselves to the healing and forming work of God. The affective (or emotional) development of a person is an important part of moral formation, especially the key element of trust. The development of trust goes all the way back to a person's childhood; human beings need to be touched with warmth and affection, loved, protected and nurtured. Otherwise in later life, they find it difficult to love or trust others (Van der Ven 1998:283-287; Van Niekerk 2009:120-124). If they are to be pastors and facilitate emotional development in others, student ministers need to understand the extent of their own emotional balance and maturity, learn to experience the love of God and other people, and begin to love others in generous and appropriate ways. Personality profiles (or constructs) refer to personality traits that give identity to a person (such as being open, reserved, warm, inclined to intellectual analysis, impulsive, organised and the like). Self-knowledge is important to help ministerial students to identify their strengths (e.g. being an extrovert who can work well with others), but also strengthen their weak areas (e.g. developing one's capacity for introversion through the spiritual discipline of solitude) (Foster 1978:84-95). Several psychological models and tests (Hall 1997) can be employed as students seek to discover who they are and how they interact with others. These include the Myers Briggs personality typology (Myers & Myers 1995),11 and the Enneagram (Enneagram Institute 2014). Students who come from toxic or dysfunctional family backgrounds, as do many South Africans, may require psychological therapy with someone who has an understanding of their Christian commitment to help them to deal with the past and move into a better future. An integrated and transformative theological education may, however, result in some students responding with 'apathy, resistance, or even anger' (Lamoureux 1999:153). Theological teachers ought to respond with sensitivity and wisdom when this occurs. In order for the church to function as a moral community, it needs to consist of people who are on a journey with God, themselves and each other. White (2006:308) points out the range of relationships initiated and maintained by Paul in the early church. Another goal is to help students deal with the hurts of the past and initiate better family relationships. Lamoureux (1999:146) suggests a teaching method that enables students to engage with the Christian story, link it to their own story and appropriate moral teaching in their own lives. A holistic theological education both 'addresses the spiritual hunger of students' and meets its 'formational and transformational' goals (Lamoureux 1999:152). The need to heal relationships and develop sound ways of interacting with others is also true for the community of the church. Otherwise, student ministers will simply re-enact the pain, suspicion and anger of their social groups and contexts. Relational formation is required at the interpersonal, inter-group (racial, ethnic, cultural, gender and economic) and social levels. Particularly in South Africa, exploitation, hardship, conflict, fear and frustration have been experienced as a result of separation, discord and profound social injustices. If the church is to become a unified, loving, caring, truth-speaking, forgiving, reconciling, justice-seeking and peace-making body of Christ, a great deal needs to happen to make this 'new community' a reality. Finally, human beings were created to be in relationship with the whole of creation, but greed, ignorance, bad decisions and exploitation have severely damaged this relationship. Being morally formed also means that this relationship requires dedicated attention. Even though ministerial educators cannot be blamed for all the subsequent decisions or faults of a minister, it is important for them to help students to identify the obstacles that prevent good relationships and ministry. The earlier life of a student will have had both a positive and negative impact on their formation. McIntosh and Rima (1997) have shown how problematic family relationships give rise to one or more personality and leadership dysfunctions. Childhood and adolescence experiences, especially when unacknowledged, form what they call the 'dark side' of Christian leadership. It is '... an over-compensation for needs that have not been met in our lives and develops as we attempt to repay the existential debts of varying degrees that we have taken on' (McIntosh & Rima 1997:63). Several types of leaders are described by the authors - including compulsive (perfectionist, workaholic), narcissistic (self-absorbed and ambitious), paranoid (insecure, fearful and suspicious), co-dependent (those who find it difficult to say 'no' and who seek to cover up problems) and passive-aggressive (procrastinators who are stubborn and intentionally inefficient) (McIntosh & Rima 1997:85-140). Students need to become aware of and admit the effect their own backgrounds have had on the shaping of their ministerial leadership profiles. We have seen that students who were ignored, unfairly criticised or even abused as children may find it difficult to trust others and to form close relationships. This could affect their relationships with other students, the staff and the institution as a whole. The cultures, in which students have grown up, will influence what they value. For example, some students may value justice and moral principles more highly whilst others value love and relationships more highly (Kretzschmar & Schubert 2009:336). Similarly, the ways students from different cultures communicate, understand leadership and view planning, punctuality, decision-making and consensus may differ widely. If students are made aware of and evaluate these differing cultural values, carefully considered Christian values, appropriate to specific needs or tasks, can be identified and conflict avoided. In South Africa, a highly emotional and contested issue is the relationship people have to the land. This is because of the expropriation of land from Africans over many centuries and different views regarding the ownership and use of the land. In addition, high levels of urbanisation amongst all groups have resulted in a degree of alienation from nature, a lack of understanding how food security is to be ensured and a lack of knowledge of matters environmental. As noted earlier, in 2 Peter 1:5-8 we find an important combination of the role of knowledge, character and relationships. Beginning with faith, each successive virtue nurtures the following one: goodness, knowledge, self-control, endurance, godliness, mutual (brotherly) affection and love. Furthermore, an attitude of personal honesty and openness towards God and others is required if good relationships are to be formed. By responding to the needs of people in different contexts, students develop a sense of responsibility. Accountability is developed by acting in a transparent manner and being answerable to others. By acquiring conflict resolution skills, students can learn to solve conflicts, be peace-makers, and enable people to work together to solve community problems, such as crime, unemployment and domestic violence. Moreover, through a process of religious socialisation (Van Niekerk 2009:108-111) individuals and groups come to accept the moral assumptions and expected behaviour of members of the church. [I]t is through the gathered life of the community that people are drawn out of the solitude of study and prayer into communion and relatedness' (Lamoureux 1999:144). As noted earlier, students need to participate in and lead worship in the college chapel or their home church so that they learn to worship together and devise good liturgies. The use of art (e.g. paintings, craftwork and sculpture), music, poetry and drama can evoke an emotional response to God and encourage shared experiences. In addition, small groups need to be formed to encourage the development of mutual support and accountability through Bible study, sharing and prayer. The spiritual disciplines of confession and guidance (Foster 1978:125-137, 150-162) can also facilitate the formation of moral relationships. Senior students or staff can mentor new students for a period of time so that students can learn to cross the race, gender and class lines that divide communities in South Africa. Interaction with other ministerial students, especially from a different context, can prevent the promotion of narrow group interests and ideologies and promote a sense of human solidarity with others. Students need other people to expose their 'blind sides' and open their eyes to the experience of others. Involvement within a college, church or university setting, or with groups in civil society that promote environmental projects, can expand the students' awareness of their relationship with the physical world in which we live. Involvement in projects that, for example, prevent pollution, clean up rivers, or care for animals will promote a sense of belonging to the earth and responsibility for all its creatures. What are the goals of right action? Attention has already been given to what can be done by students in the areas of knowing, being and relating. However, personal moral agency grows not only through study, but also through moral action (Groome 1980; Kretzschmar 2012:163-167). South African society faces numerous problems, such as unemployment, poverty, violence, homelessness, substance abuse, exploitation and corruption. Students in ministry cannot solve all these problems, but they can be conscientised, inspired and assisted to develop a moral lifestyle. Generosity, justice and compassion are not only personal, but also social moral values. We have seen that avarice, fear, indifference to the needs of others and a lack of love prevent people from resisting social evils and taking action on behalf of others. Poor relational skills and the inability to work together are other obstacles that will need to be overcome. The family and social backgrounds of ministerial students in South Africa influence what they value and the nature of their action - or lack of action - in the world. The socio-economic circumstances of students can both impede or encourage their formation. For example, students from prosperous families may be generous and seek to work alongside those who are poor, or they may ignore the plight of the poor. Students from poverty-stricken areas have personal experience of the needs of the poor that can motivate them to make a difference. Equally, a desire to escape poverty and the stress of debt and other financial concerns may impede their willingness to address the needs of the poor during and after their studies. A fear of failure can result in students being passive and inactive or they may be willing to act on behalf of others, but lack the confidence or necessary skills. The practical competencies or skills required of ministers cannot be discussed here, but are important for their future ministries. Confidence and skill develop when students take on tasks, receive fair and encouraging feedback, and continue to grow through repeated moral action. In order to counteract despair, the lack of love and indifference, social action and projects, both within the college and in local churches or communities, are means by which personal moral agency, moral courage, commitment and action can be developed. Such projects include literacy classes, support for fellow students, computer studies, care for pets, farm and wild animals, small-scale vegetable farming, HIV prevention and care, and involvement with centres that care for women and children who have been abused. Also, by working together with those business leaders, politicians and civil servants, who are dedicated followers of Christ, students can promote small business development, a Christian work ethic and clean governance. Finally, the practise of the spiritual disciplines of simplicity (avoiding excess and consumerism and being willing to share knowledge, resources and skills with others) and service (being willing to attend to the needs of others and the created world), are extremely important in nurturing moral action (Foster 1978:69-83, 110-122). This article has discussed the nature and importance of moral formation. A model has been presented that has, as its core, God's grace and human volition, because moral formation cannot be separated from spiritual formation. For Christians, moral formation is motivated by ongoing encounter with God and the progressive redemption of the human will. Four areas of moral formation were discussed, namely intellectual development, character formation, moral relationships and moral action. Within each of these four areas, several goals, obstacles and means or methods of moral formation were presented. The fruits of moral formation are seen in the growth of ethical thinking, personal integrity and just and caring relationships with others within the college and at home. Moral actions, such as acts of kindness and generosity, working for justice for oppressed groups, protecting vulnerable animals, visiting the old and sick, rescuing orphans and exposing short-sighted economic development that destroys the environment upon which we all depend, are other examples of moral formation. Moving by God's grace and human volition towards the goal of moral excellence along the path of moral formation is a multi-faceted and challenging journey, but infinitely preferable to moral failure and disgrace. 1.Even though some churches do not ordain women, many others now do, hence I use inclusive language in this article. 2.See Kretzschmar (2007; 2004) for a discussion of the academic debate regarding moral formation, including the views of Kohlberg, Gilligan, Fowler, Spohn and Van Der Ven. 3.Unless otherwise stated, I use the New Revised Standard Version for biblical quotations. 4.Oliver (2013:6) advocates the use of the R2D2 multifaceted teaching method that incorporates Reading, Reflecting, Displaying (using visual and other sensory means) and Doing. This creative approach, also suitable to distance learning, provides stimulation for students and engages them in creative learning and encourages the application of theological learning to their attitudes and behaviour. 5.Overend (2007:141) notes the focus on formation in theological education in the United Kingdom in two reports of the Archbishops' Council (2001; 2003). 7.Graham (2002) argues that Paul practiced a type of 'distance' learning in the early church. 8.Ethical issues include sexual and family ethics, feminist or womanist ethics, social, political, economic and environmental ethics. 9.See Aquinas Summa Theologiae I-II.84.3-4. 10.Lectio Divina includes the four steps of reading, meditation, prayer and contemplation. 11.Also available as a free e-book at https://www.cpp.com/pdfs/7270.pdf, viewed 05 March 2014.